You can subscribe to Pom Pom Quarterly or order your copy of Issue 21 here! Don’t miss getting a copy of our Issue 1 Reboot plus join in all the fun in our group for updates and all the Pom Pom chatter! Model has 79 cm / 31” bust, stands 170 cm / 5’7” tall, and is wearing size 2. Gauge: 24 sts & 36 rows = 10 cm / 4” over stocking stitch on 3.5 mm needle after blocking. Notes: Fête is knit in the round from the bottom up to the neckline, where it is split to work back and forth while neck shaping occurs. Armhole shaping is then worked and the fronts are split from the back to work separately. 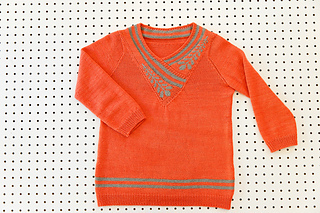 After the fronts and back are complete, the sleeves are picked up and knit down with short row sleeve cap shaping. Once the body is complete, the neckline is worked in a series of steps, then finally seamed together.